Protein NDRG1, N-myc downstream-regulated gene 1 protein, Differentiation-related gene 1 protein, Reducing agents and tunicamycin-responsive protein, Nickel-specific induction protein Cap43, DRG-1, RTP, Rit42, NDRG1, CAP43, DRG1, GC4, NDR1, NMSL, TDD5, CMT4D, HMSNL, TARG1, PROXY1. General Description of Recombinant Human NDRG1. 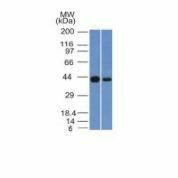 Human NDRG1 fused with 8 amino acid His tag at C-terminus produced in E. Coli is a single, non-glycosylated, polypeptide chain containing 402 amino acids (1-394 AA ) and having a molecular mass of 43.9 kDa. The NDRG1 is purified by using an optimized multi-step FPLC method for maximum separation from contaminants. Host: QP10791 protein expressed in E. Coli. Protein Construction: A cDNA sequence encoding the sequence of NDRG1 was constructred and used to recombinantly synthesize the protein. Application Notes: Please contact us for application specific information for QP10791. Bioactivity Data: Measured in a cell proliferation assay using MCF7 cell. 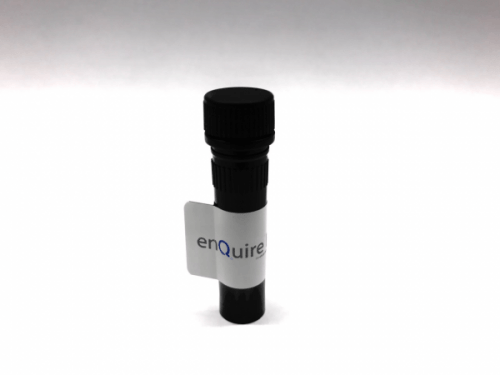 The ED50 for this effect is 0.5 - 1.5ng/ml, corresponding to a Specific Activity of 666,000 -2,000,000 IU/mg. Buffer: The NDRG1 solution contains 20mM Tris-HCl buffer (pH 8.0), 0.1mM PMSF and 10% Glycerol.